could anyone help me to identify this mark, please? I am going to buy this rose family vase, the vendor allowed me to take only this photo and the price is quite high. 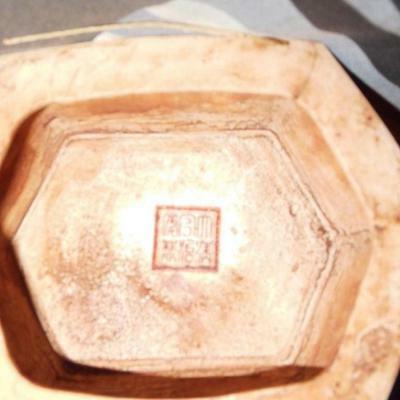 Could be a real Tongzi, or an apocryphal mark? Thank you Peter, I have myself had doubts regarding the autenticity of the vase, I have not seen yet a hexagonal vase with this type of red mark. I appreciate very much all your efforts. Marks in red on an unglazed bottom are always spurious, and the items having them are usually modern fakes. Even if this is a Tongzhi mark, there are no Tongzhi marks written in this manner and with such characters on antique items.